While breastfeeding is not the right choice for every child and/or mother, it can have a variety of benefits when it comes to children’s oral health. On the other hand, there are some important precautions moms should take when breastfeeding to help protect oral health, too! A June 2015 study from Pediatrics found babies that were breastfed exclusively for six months were 72% less likely to develop malocclusion. These babies were less likely to develop open bites, crossbites and overbites than babies who were breastfed for less than six months or that were not breastfed at all. 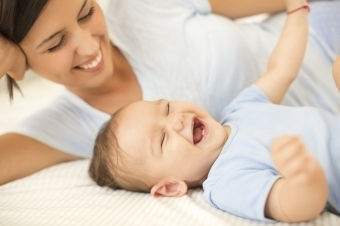 Now, this doesn’t mean your baby won’t need braces someday if he or she is breastfed. And it also doesn’t mean that bottle fed babies will necessarily develop malocclusion. There are many other factors that can have an impact on your child’s future orthodontic needs, including genetics, pacifier use, and thumbsucking. Baby bottle tooth decay is the result of frequent and prolonged exposure of a baby’s developing teeth to drinks that contain sugar. This most often happens when babies are sent to bed with a bottle of formula, milk or juice. Breastfeeding, especially exclusively, can minimize or remove this risk. Breatfed babies can get cavities, and in fact, breastfeeding can even cause cavities. Although breast milk is viewed as more ‘natural’, it still contains sugar just like formula does and this, of course, can lead to cavities. That’s why, whether you're breast feeding or bottle feeding your baby, it’s important to regularly clean his or her gums with a clean, damp cloth or gauze pad. And the moment the first tooth comes in, start brushing your baby’s teeth twice every day to avoid tooth decay from the start. If you have questions about breastfeeding and oral health, or about how to brush your baby’s teeth, please contact SmileTown Burnaby to book an appointment. We can help!